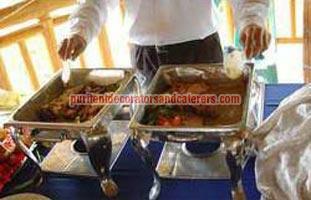 We are dedicated professional and fully integrated provider of Outdoor Catering Services to organize all types of functions. Our dedicated team makes your personal or corporate events a successful, scrumptious event. Beyond our extensive menu selections from multi-course banquets to hot, ready-to-serve dishes and pickup-and-go pan foods. We offer a full complement of Catering Services to fit your party or event plans. Our full range of Outdoor Catering Services covers complete food preparation and presentation for formal or informal gatherings plus all setup, cleanup, tear down and as-requested amenities. We have been providing attractively presented, delicious gourmet cuisine since 2000. We take the worries out of your catering needs and attend to the details so you can relax and enjoy the festivities. Whatever be your party particulars, your guests will savor our exceptional food and above-par services when we handle your catering needs.